(ANNAPOLIS, MD) Junior League of Annapolis, Inc. (JLA) will host Paint the Bay for the second year in a row. 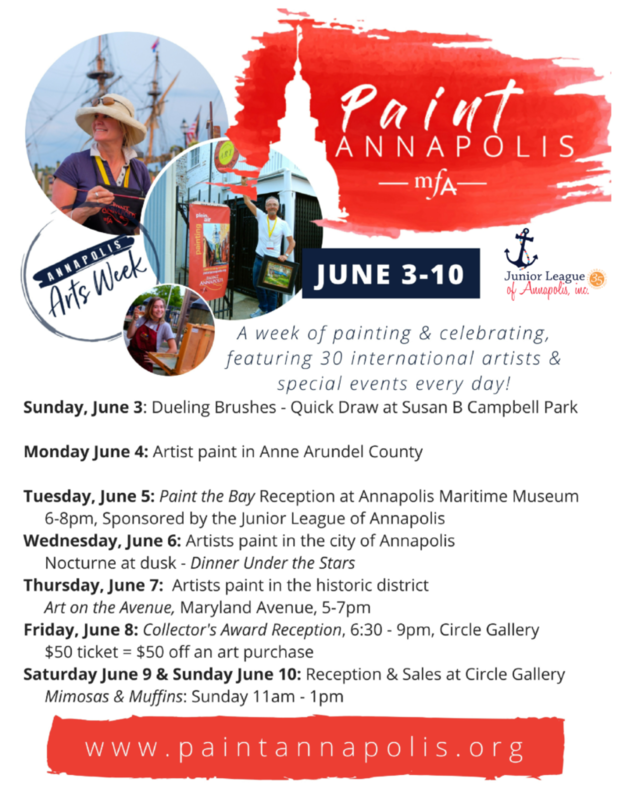 Join us at Annapolis Maritime Museum, Tuesday, June 5th from 6:00 – 8:00 p.m. for the Paint the Bay reception. This exhibition is part of Paint Annapolis, a week long, juried “plein- air” painting competition that brings to Annapolis painters from around the world. This reception will feature artworks completed by juried artists featuring the Chesapeake Bay. Beautiful artwork from the “Paint the Bay” day will be displayed and on sale if anyone chooses to purchase. 40% of proceeds will go back to JLA. JLA representatives will judge the artwork for a cash prize (provided by MFA) An evening of friends and festivities! You may also contact admin@jlannapolis.org for more information or the JLA office at 410‐224‐8984.